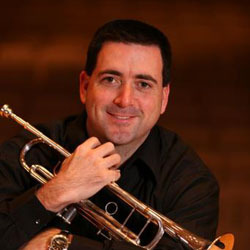 Alex Parker is the Director of The Wayne Fisher Jazz Program at Baylor University. He directs the Baylor Jazz Ensembles and teaches many jazz disciplines. Mr. Parker holds the MM from the University of Miami and a BM from the Eastman School of Music. His background is in jazz writing, performance and pedagogy, as well as trumpet performance and instrumental teaching. Before coming to Baylor, Mr. Parker taught for five years in the public schools. He is a founding director of the Texas Jazz Educators Association (TJEA), the Executive Officer of TJEA, and the editor of the Texas All-State Jazz Etudes. As a writer and arranger Parker has written for the Harrisburg Symphony, the US Air Force Band in Washington, DC, and collegiate ensembles. He has performed clinics, adjudicated and directed jazz ensembles all over the country and Costa Rica, and continues to perform as a free-lance musician. Mr. Parker also serves as the Director of Baylor Summer Music Camps and won the Outstanding Professor Award for Teaching in 2010.